Founded in 2001 by Kurt Robertson, Franchise Gator, LLC is an online enterprise that produces revenues from the sale of sponsorships to providers of new franchise and business opportunities that appear on its website, FranchiseGator.com. FranchiseGator.com is the leader in the online market for new business opportunity lead generation, connecting approximately 350,000 visitors each month with franchise and other new business opportunities, providing some of the nation’s most recognized franchisors of all types – such as Kentucky Fried Chicken Franchises and Ace Hardware – with an average of approximately 30,000 qualified, cost-effective Internet leads per month. Launched in 2002, FranchiseGator.com is firmly established as the number one site – as measured by Market Metrics – among franchise-only sites in the search-based online franchise and other new business lead generation market. 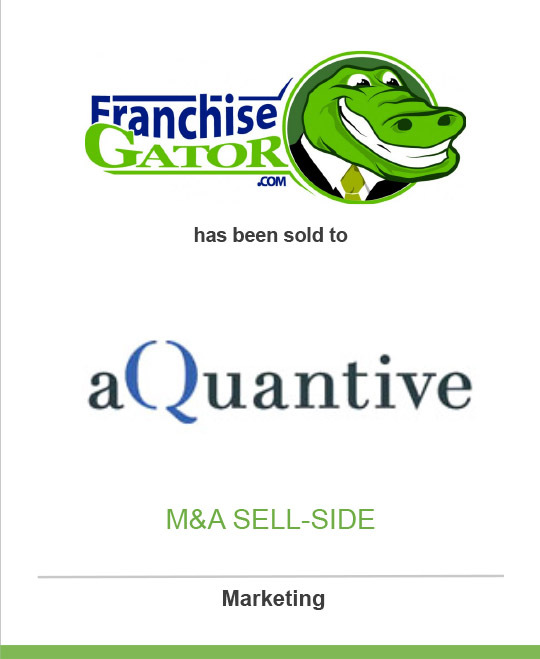 aQuantive, Inc. (NASDAQ:AQNT), a digital marketing company, was founded in 1997 to help marketers acquire, retain and grow customers across all digital media. Through its operating units, Avenue A | Razorfish (www.avenuea-razorfish.com), a full-service interactive agency, Atlas (www.atlassolutions.com), a provider of digital marketing technologies and expertise, and DRIVEpm (www.drivepm.com) and MediaBrokers, digital performance media companies, aQuantive is positioned to bring value to any interaction in the digital marketplace. aQuantive (www.aquantive.com) is headquartered in Seattle, Washington.